Integrity is powerful thing. While, in many cases, we have reduced it to a measure of consistency in thought, behavior, speech, etc., it means more than that. It has to do with wholeness, with the pieces of a whole being held together securely. The foundation of a building begins to lose its integrity (or, practically, disintegrate) when it cracks, its constituency (brick and mortar) begins to disintegrate, and it can no longer support the weight of the building resting on it. At the start, brick and mortar were securely connected to one another. There were no cracks and no giving way. But, as the foundation begins to compromise… one crack leads to another and another and another until eventually the walls of the foundation begin to bow. Before long, the building as a whole begins to fall apart and is headed toward demolition. 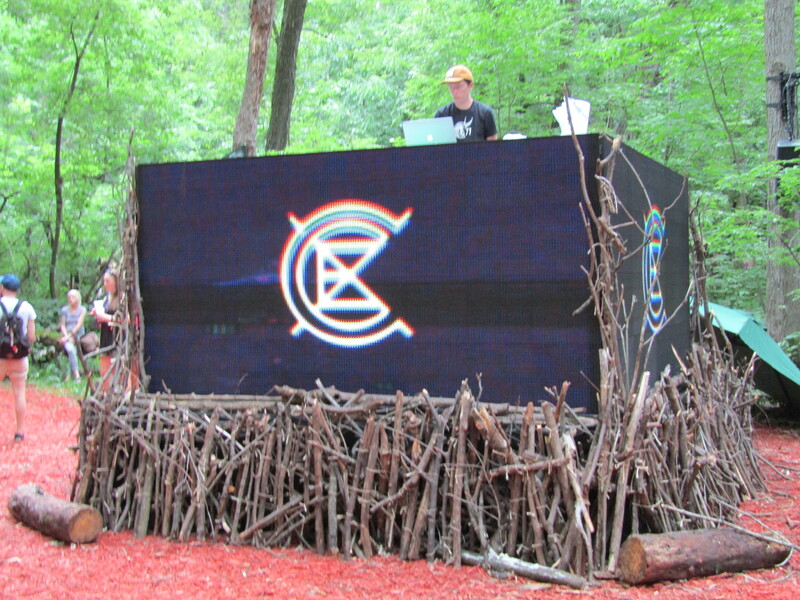 My first Eaux Claires experience, in a true and deep sense, shook my soul, my very foundation. If I’ve had a conversation with you about it, you know how deeply it impacted me. Quite literally, I took weeks to recover emotionally. Beach House’s Space Song haunted me on a regular basis and Bon Iver’s 22 (Over Soon) was a continual invitation into not only the rest of 22, A Million, but right back into the emotion I felt during those two days. I was overwhelmed with an awe of the God-given creativity I experienced that weekend and I felt as though I was a part of something very special. Last Christmas, my beautiful and generous wife bought me a ticket for the third edition of the festival, and I couldn’t wait to hear about the lineup and start dreaming about what this year’s experience would be. When the lineup was announced, I was very excited to say the least. I mean, Paul Simon with yMusic! Sylvan Esso! Music for the Long Emergency! Now, while I was very much looking forward to the event, I was also trying very hard to temper my expectations. 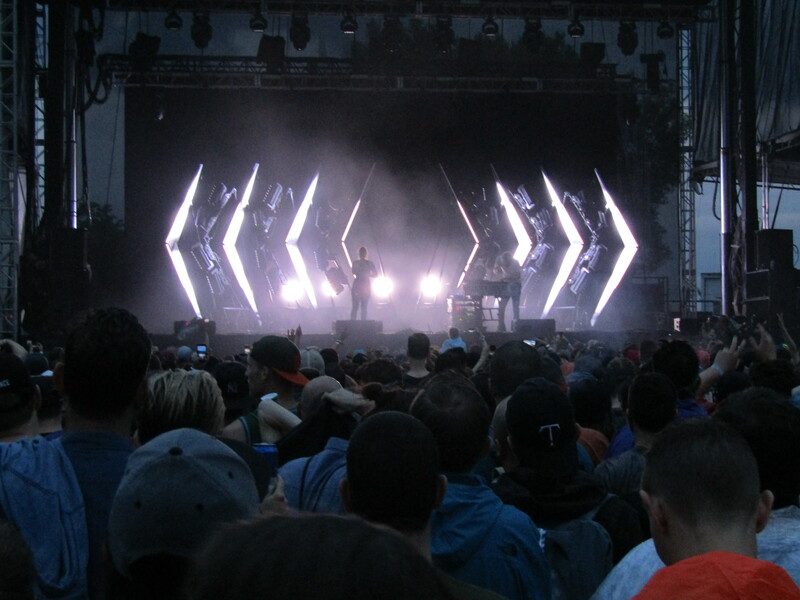 After all, Eaux Claires Deux was an emotional and spiritual event for me. I shouldn’t expect that to happen every year, right? Well, I was wrong about that. Troix was emotionally and spiritually moving, just as Deux had been. However, the emotional and spiritual dynamics were quite different this time around for me. For this attendee, this year’s festival was a combination of joy and sorrow. I didn’t expect the sorrow, and it was the reason I actually left the festival early on Day Two. It was a sorrow borne out of what I saw as extreme inconsistency, or compromised integrity, in several aspects of the festival. Before I dive too deeply into that subject, let me reaffirm, there certainly was joy. Sylvan Esso. Sylvan freaking Esso. The Durham duo was incredible and they created such vibrant energy in the crowd… it was impossible to stand still during their set. It didn’t hurt that Amelia Meath and Nick Sanborn looked like they were genuinely feeling it that night as well. 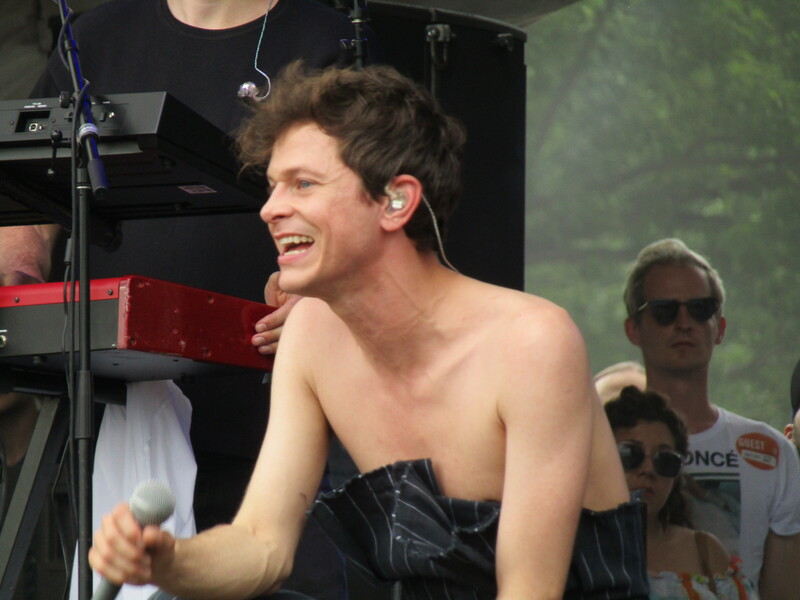 I thought Perfume Genius was pretty incredible as well. Mike Hadreas and band came across as this eclectic blend of provocation, expression, and straight out fun as well. I also really enjoyed Collections of Colonies of Bees and Zebulon Pike. Collections was one of the first acts to play on Day Two and they were tight. Incredible creativity and craftsmanship. I need more. And Zebulon Pike… let me tell you, it did this old heart good to witness four guys about his age rocking like those guys rocked. The Minneapolis instrumental metal outfit were able to blend passion and precision in their performance in ways I don’t often see. While these performances were great, the most poignant moment of the festival for me occurred early on Day Two, when s*t*a*r*g*a*z*e welcomed Minneapolis rapper Astronautalis to the stage. The day before, we learned of the acquittal of the police officer who killed Philando Castille. I hadn’t heard of the verdict until it was announced by Broder as he began his set on Friday afternoon (more on that in a bit). When Astronautalis took the mic, he was flowing on about how blessed he was to be a part of the day, to experience the beautiful sunshine, and on and on. But then his words told the story of his mixed emotions. Yeah, he was grateful and should feel happy about the moment, but he kept “thinking ’bout Philando.” It was a beautiful, soul-bearing moment in which he could not help but feel the weight of injustice. And my heart resonated with his. It was broken as well. My recollection of that incredibly emotive, connecting moment leads me right into parts of the Troix experience with which I struggled terribly. As noted, the Philando Castille situation colored the festival. I first heard the verdict just as Broder was starting his set. Before the music began, the he mentioned what happened and encouraged the audience toward love and peace, which was beautiful. But then he said (this is verbatim to the best of my recollection), “Rest in peace, Philando. And rest in piss to the motherf*cker who (killed him).” This statement struck me as wildly inconsistent with his previous words about “peace” and “love.” For me, I found this kind of inconsistency to be a virtual theme running throughout the festival, and it ate at me throughout the weekend. Another example of this inconsistency (or compromised integrity) was the festival being presented as an “All Ages” event. The Eaux Claires website states, “All ages are welcome, children ten and under are free.” “All ages” is also printed on the ticket. This would lead me, and likely others, to think the event is family-friendly. Now, I remember, during last year’s festival, seeing kids there and wondering if it was a good thing for them to be exposed to some of the lyrical content flowing from the artists. This year, that tension was palpable for me, and it began from the very onset. The first set on Friday saw Justin Vernon, Aaron Dessner, and friends playing what they called “People Mixtape” on a small stage. Now, creatively, it was a fun set and I really enjoyed it. However, one of the very first songs had Vernon repeating “I don’t want to f*ck it up” over and over again. As I stood there listening, just in front of me was a young girl, maybe 7-8 years old. As the father of an 8 year old, I would not want my son listening to that. This little girl stood there trying hard to protect herself from what she was hearing, hands clasped tightly over her ears. My heart sank a little bit in that moment. And then there was the Spank Rock set on Day Two. In the months preceding the festival, I spent time trying to get to know the artists’ music so I would know whose shows I wanted to make sure I did not miss. Spank Rock and Danny Brown were two I quickly determined I wanted to miss. It wasn’t because of the music. I thought the few songs I listened to were funky, fun, and creative, musically speaking. But the lyrical content was just gross. The songs I previewed were sexually explicit, graphic, and unfortunately vivid, and some degraded women. So, I determined that I would be glad to miss those two sets. However, when the time for Spank Rock’s set arrived, I decided to give it a chance. I thought maybe he would show some restraint in what had been billed as an “All Ages” context. Such was not the case. What made it worse was seeing children mixed in with the crowd while Spank Rock’s sexually explicit lyrics poured over their little ears, minds, and hearts. Now, we can debate on whether or not such lyrics should even be shared at all in a public forum, but I would suggest what is not debatable is that kids should not be exposed to such things. In fact, according to psychologist Dan Allender (in his book, The Wounded Heart), such exposure is tantamount to sexual abuse. My heart was broken for these kids. I walked away from the stage and tried unsuccessfully (more on that later) to escape the barrage of graphic language and content, and process what I was feeling about the whole Spank Rock experience. Again, the divide between the “All Ages” concept and the inundation of vivid sexual content for children’s ears screamed of the aforementioned compromised integrity. Spank Rock’s lyrics are not only sexually explicit, but they are also blatantly misogynistic. He consistently refers to women as “b*tches.” Now, I don’t know if some folks are numb to this or if they simply choose ignorance, but this is wrong. Women are not dogs. Women are beautiful, powerful beings created in the very image of God and they are not to be demeaned in such ways. And several of the artists featured at this year’s Eaux Claires use that term when referring to women. It’s not okay. It wasn’t okay with Donald Trump referred to a woman as a “b*tch” in that infamous Billy Bush video, and it’s not okay for a rapper to do it either. For me, this was perhaps the most glaring inconsistency I experienced at this year’s Eaux Claires. The vibe last year, for me, was one of connection, celebration, and respect. Empowering people to be who they are seemed to be part of that vibe. Women being seen as equals to men and being celebrated for who they are… this felt like an inherent part of the Eaux Claires ethos. But then we have artists take the stage and refer to women as dogs… There is no respect there. There is only misogyny (which was being funneled into the ears of little girls and little boys). I mentioned earlier about not being able to escape the Spank Rock experience. There was a reason for that. When I was previewing music for the 2016 edition of Eaux Claires, I had similar concerns about Vince Staples’ lyrics as I did about Spank Rock (and Danny Brown) for this year. So, when Staples’ set was to begin, I simply walked up the hill and was able to escape, while enjoying other music (last year, the grounds were basically set up into two sections, a lower section housing the two big stages and a couple of smaller ones and an upper section with three other stages, separated by a walking path through the woods). This year, the planners reconfigured the grounds so that everything was on one level. Now, I understand the idea was for the festival to be more of a shared experience. Admittedly, there were times in which the two separate sections felt fairly disconnected from one another. And I understand there were complaints about two popular acts playing in the same time slot (i.e. Beach House and Nathaniel Rateliff on Day Two last year). So, I understand why they made the adjustments and was optimistic about it going into the weekend. The organizers were explicit about wanting attendees to experience more of the festival “together,” and having all sets originate from the “lower” section was an effort to facilitate that togetherness. However, for me, that change greatly hindered the overall experience. Yes, more of us attendees experienced the festival “together,” so that goal was achieved. However, the main grounds were significantly more crowded, obviously. I found the more densely populated main section a little overwhelming and at times I felt little claustrophobic. I know this was probably great from the perspective of the artists. After all, they had more people at their sets than they would have had in years past. But, for me, it made the whole weekend much less enjoyable. I felt as though, in an effort to bring people together, I was being forced into a shared experience, which is always going to hinder said experience. In fact, this forced togetherness along with all of these perceived inconsistencies in mind, led me to feeling very alone amid the 20,000 or so people who were there. Whereas in 2016, I felt deep connection with what was happening, the music, and my fellow attendees, this year I felt isolated and as if I didn’t belong there. In fact, by Saturday evening, I was even feeling a bit depressed. Halfway through Feist’s performance, I walked over to stage known as The Creek, sat down in one of the plastic chairs, and found myself longing for home. This was a far cry from what I had experienced on the Saturday evening of last year’s Eaux Claires. I still remember vividly how incredible Lucius was that night, how I was captivated by that performance, and how I couldn’t keep myself from moving. I was floating on the proverbial Cloud Nine. I can still feel how deeply I was stirred as I walked away from the festival to the tune of Beach House’s Space Song. But Saturday night felt much different for me this time around. As I sat there with my head in my hands, I seriously contemplated going home early. Paul Simon and yMusic was one of the sets I was most excited about and they had not played yet, so I really wanted to hang on and be there for that. However, I was also aware that to get to Paul Simon I had to wait through Danny Brown’s set, and I had similar concerns about his lyrical content as I’d had about Spank Rock. And I couldn’t escape the things he would say. There was no upper section for me to retreat to. Eventually, after a moment of prayer, I decided to go home. To say I was disappointed in my 2017 Eaux Claires experience would obviously be a major understatement. I would never have dreamt that I would actually leave early, especially after the way last year’s festival rocked me. But I did. And as I walked away, I wondered if this would be my last Eaux Claires, a thought which saddened me deeply. After several days of reflection, my heart and mind settled a bit, and I decided not to make any rash decisions about next year. I still think Eaux Claires is not only special, but it has the potential to be deeply and positively impactful for attendees. For that to happen, in my unsolicited opinion, there has to be more consistency, more integrity. If we are about love, peace, and creativity, then the content coming from the artists ought to line up with those ideals. Eaux Claires Troix lacked integrity, from my perspective, just as a cracked foundation has lost its integrity. The desire was to connect people in shared experience, but that connection felt forced to me. Crack. Women are to be respected and valued, but our artists call them “b*tches” from the stage. Crack. Our tickets state the event is “All Ages,” but there is profanity, the degradation of women, and sexually explicit lyrics flowing through the speakers. Crack. Unless these cracks are filled and the foundation restored, I don’t know how long Eaux Claires will retain its uniqueness and its potential to create significant positive change both for its attendees and for the Chippewa Valley. I think your opinions on the festival as a whole are very narrow. You’re bad experience isn’t the fault of the festival itself. You had a bad time because you didn’t connect with the musical acts as much as last year. We can’t tend to all 20,000 people’s music taste. It is hoped that in later years, there will not even be a lineup. That’s how important the art of MAKING music is to us. Creativity should not be hindered because some people have a problem with lyrics. It makes my heart hurt a little because I personally put so much work into this festival; and to see you disregard the festival as a whole because you didn’t enjoy TWO of the musical acts is very disappointing. Hi Sarah – I appreciate you taking the time to share your thoughts. My intent was certainly never to hurt anyone’s feelings. This is simply one man’s experience. However, I would say that if you gathered from the post that my disappointment stems from simply not enjoying two of the artists, either I didn’t communicate very well or perhaps there were other elements of the post you missed. I would love to discuss this with you if you’d like. My hope is that sharing my feelings about this year’s edition will spawn conversation that will help Eaux Claires continue to improve.